Scotch pancakes are up there when it comes to easy cooking. These delicious, light, fluffy confections make a great breakfast, tea time treat and frankly, are delicious at any time. Scotch pancakes are different ​from the traditional British 'crepe' generally eaten on Pancake Day. The scotch versions are thicker and slightly risen and cooked on a griddle or a frying pan; not unlike an American pancake and are also known as Crempog in Wales - though do not ask for them with his name in Scotland or the other way round, you will not be popular. Based on a recipe by Gilli Davies from her book Celtic Cuisine. 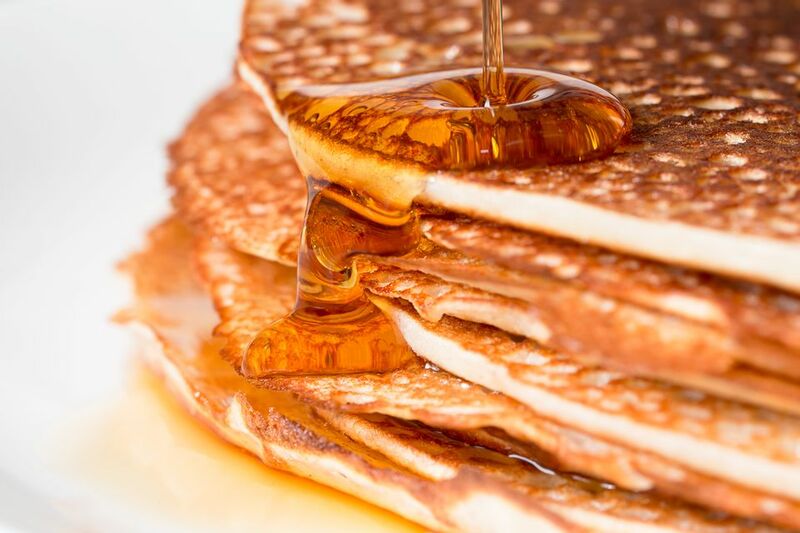 Start your pancakes by placing the butter into a non-stick pan and add the buttermilk. Heat gently, but do not boil, the buttermilk needs to be just warm enough to melt the butter. Put the flour into a roomy baking bowl, and once the butter is melted into the buttermilk, slowly pour into the flour whilst whisking continuously. Once all the butter and milk is added, beat the mixture really well to remove any lumps and then leave the mixture to stand for at least a 30 minutes, if you can leave it longer than that, even better. Pour the beaten eggs into another bowl and stir in the sugar, bicarbonate of soda and vinegar. Once added, stir this mixture into the well-rested flour, butter and buttermilk mixture. Beat well to create a smooth, lump-free batter. Using a little butter or vegetable oil, grease a griddle, hot-stone or a heavy-based frying pan. Heat over a medium to high heat until very, very lightly smoking. Drop the batter, one tablespoon at a time on to the heated griddle/pan/stone and cook the pancake until golden brown on both sides. Once cooked through, remove them from the pan and keep warm. Continue with the remaining batter until it is all used up. Serve the Scotch pancakes spread with a little butter while the pancakes are warm and enjoy as a side dish on your breakfast, or serve with jam or honey as part of your afternoon tea. Resting the batter is one of the best ways to create perfect Scottish pancakes. Beating the batter and making sure it is lump free ensures the batter will rise and create a light, airy and, of course, delicious Scotch pancakes. Scotch pancakes are best eaten fresh from the griddle or pan. They are so easy to make so there is no need to store them. If you must, then wrap in greaseproof paper and store in an airtight box or tin.